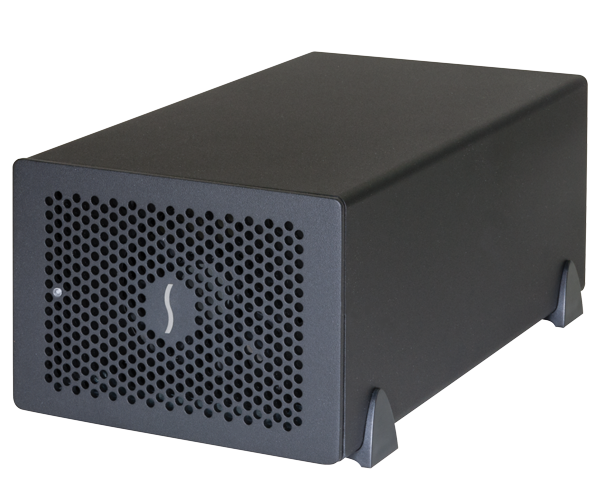 Sonnet’s Echo™ Express SE III (Thunderbolt 3 Edition) is a compact desktop Thunderbolt™ 3 to PCIe card expansion system that enables you to connect three professional PCIe cards—including video capture, audio interface, SAS or SATA HBA, 16Gb or 8Gb Fibre Channel, 10 Gigabit Ethernet, and RAID controllers—at the same time to any Mac® or Windows® computer with a Thunderbolt 3 port. The Echo Express SE III features a 40Gbps Thunderbolt 3 interface, which offers double the PCIe bandwidth and connectivity of Thunderbolt 2, and yields up to 2750 MB/s of bandwidth, enabling it to support 4K video capture and processing cards at high frame rates, and 16Gb FC cards and dual-port 10GbE cards at full performance. With the ability to handle multiple demanding, high performance PCIe cards, support for connecting two 4K displays @ 60Hz or one 5K display @ 60Hz, and support for a vast array of Thunderbolt and USB devices, Thunderbolt 3 is a leap forward in every way. Honest and sincere, gives good suggestions. Will come again. Profession and honest , effective suggestions, support!!!!!! Johnny was informative and genuine. He quickly replaced a faulty ssd in my MBP and installed the OS etc. Very happy with his service. Johnny was really friendly and helpful! Thank you for saving my files! Very profession and nice service, thanks Johnny. 小弟讀書嗰時買嘅 MacBook Pro 2012, 由依幾年開始已經變得好慢。多得 Johnny 幫我升級 SSD，依家部 macbook 嘅速度好似新嘅一樣。俾幾千蚊點都平過俾幾萬蚊買部新 macbook. 多謝 Johnny! 一個有心、有效率、有善的 MAC user!